Servings vary depending on use. 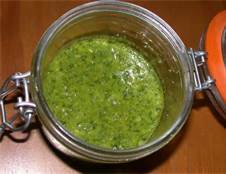 Pesto is very versatile and can be used to top eggs, whole grain pasta, quinoa or brown rice, chicken, fish, beef, burgers, sandwiches, soups, salad dressings, etc. Feel free to get creative with the ingredients and make your own version of pesto. Pesto can also be frozen into individual servings by using a bpa free ice cube tray. Place the basil in a food processor. Pour in about 1 tablespoon of the oil, and blend basil into a paste. Gradually add pine nuts, Parmesan cheese, garlic, chili powder(if using), and remaining oil. Continue to blend until smooth. Place arugula almonds, lemon juice, lemon zest and 1 tablespoon of the oil and pulse until blended into a paste. Add the rest of the oil along with the salt and pepper. Place the pine nuts red peppers, basil, garlic, parmesan cheese and 2 tablespoons of the oil in a food processor. Process until smooth and thick, adding more oil as necessary to create a thick paste. Season to taste with salt and pepper.